Why Is Aeration and Seeding So Important? 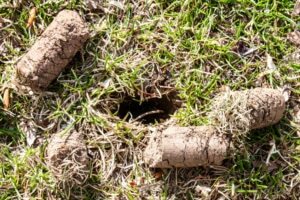 If you are new to lawn care, or have only recently gotten serious about turf maintenance, you may be hearing a great deal about a service you were previously unfamiliar with: Aeration and Seeding. But what exactly is Aeration and Seeding and why is it so important to the lawn care process? Aeration and Seeding (sometimes referred to as “core aeration”) is the process of pulling out “plugs” or “cores” of soil from the lawn with an aerator, while simultaneously spreading seed over the aerated turf. 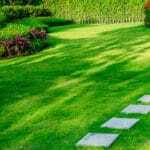 While fertilization and weed control applications will improve the healthy grass and remove the unwanted weeds, reducing compaction and introducing new seed to the turf is an essential step in achieving a thick and healthy green lawn. The aeration process is important because over the course of the year, as a result of weather and standard foot traffic, the soil will become compact and cement like. Aerating the lawn breaks up this compacted soil and improves the oxygen flow to the root systems of the healthy grass. It also greatly increases soil to seed contact, which is essential for germination of the seed. 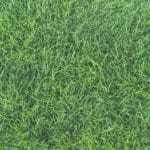 It is recommended to leave the plugs of soil on the turf, as the nutrients from the plugs dissolve back into the turf and act as a natural fertilizer for the newly planted seed. 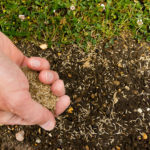 Adding new seed to the turf during the aeration process is highly recommended, as bare areas may be the result of a full season of weed control. 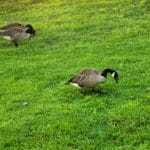 Filling in the vacated areas with healthy grass will restore the uniform healthy look to the lawn, but more importantly, it will crowd the turf to lessen the ability of invasive weeds to continue to spread in the lawn. Weeds can be fought every season, but if there is never a replenishment of healthy seed, the same areas will fall victim to invasive weeds and continue to be problematic. Late Summer or early Fall is the best time of year for aeration and seeding. Cooler temperatures are important for a successful aeration and seeding, as these temperatures will keep the turf damp for a longer period of time when watered or when there is rainfall. It is crucial, however, to have the seeding done early enough in the season to achieve germination several weeks before the first frost. For these reasons, it is highly recommended to do the aeration and seeding at the very end of the Summer or the beginning of Fall. Although there is a small window of time in the Spring where the service may be successful, it is typically not worth the investment of time and money, as there are too many variables that may have adverse effects on the service if done at that time.